Join an eco-tour of Iriomote Island by me, Ken, your personal guide! I will guide you through various places from the wide ocean of coral reefs of Iriomote which is referred as the Galapagos of the Orient, to the jungles and vast mangrove of Iriomote, the waterfalls flowing down to unexplored regions, and explore the culture of the island. I will try my best to satisfy each customer request from those who is visiting Iriomote Island for the first time to repeat travelers. Each of these trips will be a new adventure. I put all my heart into creating a fun tour that remains in everyone's memories for life. 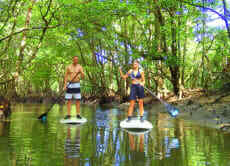 Explore Iriomote Island on a Stand Up Paddleboard!